We have the experience and expertise to diagnose and solve your stucco repair problems. We provide written proposals and will schedule the work in a timely manner. We are just a phone call away! 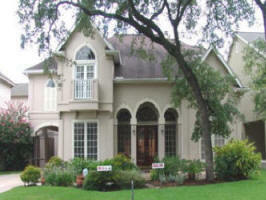 Hardcoat & Synthetic (EIFS) Stucco Repairs Do you have stucco cracks, bulges or even stucco falling off of your house? This may mean you have rotten wood under the stucco. We can help! Whether you have hardcoat or synthetic stucco (EIFS - Exterior Insulation & Finish System) We can correct the problem. 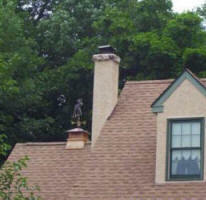 We do stucco chimney repair and repair bird holes too! Diverter flashings, proper water sealing and painting with elastomeric coating are all necessary to maintain the stucco and seal out water and moisture on your home for years to come. 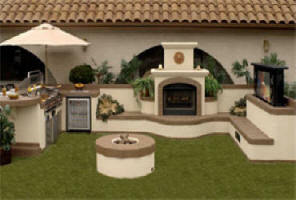 Traditional stucco is a cement mixture used for siding, usually on Mission or other Spanish style homes. The cement is combined with water and inert materials such as sand and lime. Usually, wooden walls are covered with tar paper and chicken wire or galvanized metal screening. This framework is then covered with the stucco mixture. 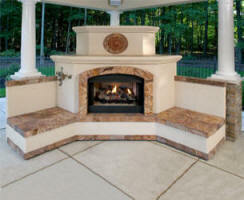 Sometimes, the cement mix is applied directly to specially prepared masonry surfaces. Although stucco-sided homes became popular in twentieth century America, the concept of using cement mixtures in architecture goes back to ancient times. Wall frescoes by ancient Greeks and Romans were painted on fine-grained hard plaster surfaces made of gypsum, marble dust and glue. Stucco techniques were elaborated by the Italians during the Renaissance and spread through Europe. This marble dust compound could be molded into decorative shapes, polished to a sheen or painted. 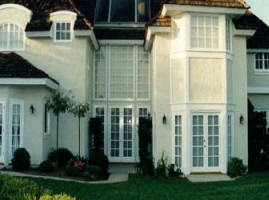 Many homes built after the 1950s use a variety of synthetic materials which resemble stucco. 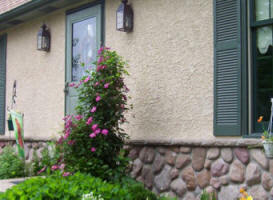 Mock stucco siding is often composed of foam insulation board or cement panels secured to the walls. 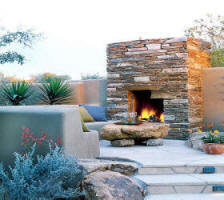 Although synthetic stucco may look authentic, real stucco tends to be heavier. Walls made of genuine stucco sound solid when tapped and will be less likely to suffer damage from a hard blow. Also, genuine stucco holds up well in wet conditions. Although it is porous and will absorb moisture, it will dry easily, without damage to the structure. Local Stucco Contractor Replace Siding FREE Quote ➨ Local Re-Stucco E.I.F.S Company Reclad Repairs E.I.F.S Local Stucco and exterior coating. Stuccoed our Home and Outdoor Walls.